Referees, the hardest position on a professional football pitch, bar none. These guys are now as professional as the players and get paid nowhere near the money. They have 30 cameras watching their every move, and are criticised for the smallest thing, that they would never see in real time. But they have a responsibility to be a as fair to both teams as they can. They also have their recently promoted “assistants”. The clue is in the title, they are there to assist, not just react to offsides and throw in’s. Step up Andre Marriner. Apparently, one of the best refs in the league, had a shocker yesterday. I have never been to a game where the ref makes the wrong call on 3 corners, all against one side (hello assistants !). He disallowed a goal for an alleged foul by Guy Demel. He gave all manner of odd decisions in the favour of Sunderland. This played into his hands, as the WHU players started to get frustrated with these decisions and started to worry more about kicking and moaning than playing. However there was a football game going on in amongst this ineptitude. Without the suspended Kevin Nolan, Diame came in, and showed his superiority by running nearly all the first half. Jussi was feeling the pressure and started having a pop at the fans after a poor clearance. 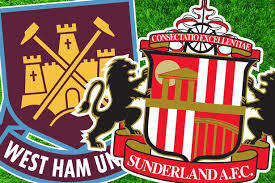 Sunderland fought a valiant rear guard but had no teeth going forward, as Tomkins and Collins were comfortably on top. But, the disallowed goal aside, WHU made no serious attempts on goal. Jussi made a fantastic save just on half time, to stop the Black Cats going in ahead. The second half was more of the same with Sunderland probably having the edge. They brought Jussi into action more than once, and he was equal to everything they had. Diame was very quiet, and Joe Cole was subbed off for Collision due to his half hearted attempts at being involved. He really needs to decide if his heart is in playing for this club, or if he happy picking up the wages. Another disappointment was this year wonderkid, Ravel Morrison. A couple of times he had a run at them and frankly terrified them, then would go back into his shell for 10 minutes. He needs to be more consistent. Plaudits of the day go to both centre backs who dominated all day. Especially Tompkins, who has played his way back into Sam’s starting line up. His frustrations in our play were also plain to see, as he went on a couple of 60 yards runs with the ball to try and inspire the midfield. So 0-0 and another point to keep us just out of the bottom 3. We just need to hold on to that status until we can spend in Jan. I will be missing the next 2 home games, so hopefully we get some points (!). I missed the Fulham game and that was a great 3-0 win, so anything is possible. MOTM, shouts to Collins, Tompkins and 1/2 of Diame. And welcome back to George McCartney who put in a sterling performance at the back. But once again Jussi held firm to keep us in the game.